The National U.S. Chamber of Commerce (NUSACC) completed today the first annual road show for Arab Commercial Officers from Washington and New York. 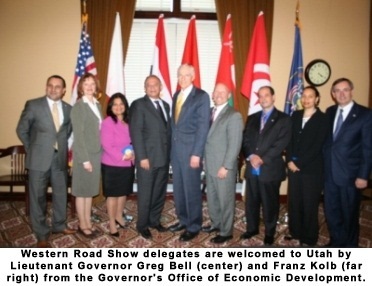 Trade representatives from Bahrain, Egypt, Morocco, Oman, and Tunisia traveled to Salt Lake City and Los Angeles and met with over 200 American companies, leaders in education, and local government officials, including Utah Lieutenant Governor Greg Bell and Los Angeles Deputy Mayor for Economic and Business Policy Matthew Karatz. NUSACC Executive Vice President Curt Silvers stressed, "U.S. trade with the MENA region continues to grow strongly. NUSACC's 2015 Trade Outlook, which will be released soon, shows U.S. trade with the region reaching $167 billion in 2015, up from $84 billion last year. Clearly, economic and political uncertainties have not derailed trade with the MENA region and NUSACC was happy to support this delegation's outreach to Utah and California." 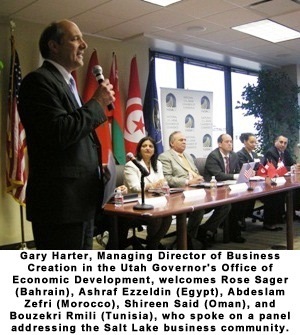 The "Embracing U.S.-MENA Global Trade Alliances" road show began in Salt Lake City at a conference hosted in partnership with the Utah Governor's Office of Economic Development, the Utah World Trade Center, the Salt Lake Chamber, and the U.S. Commercial Service. It concluded in Los Angeles where the delegation participated in the launch of World Trade Week. Utah Lieutenant Governor Greg Bell welcomed NUSACC to Salt Lake for the second time in under a year. "The bridges NUSACC is building between Utah and the Arab World are deeply appreciated and critical for the economic success of the state." In Utah, the delegation also met with companies involved in solar power and renewal energy, medical technology, training and education, and also addressed a group at Brigham Young University. 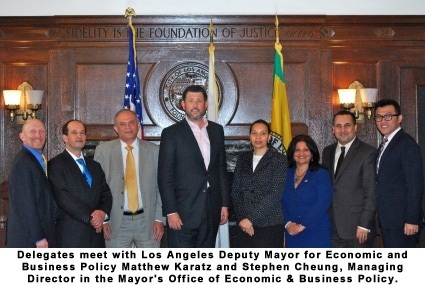 ​In Los Angeles, the visit began with a delegates' roundtable -- in cooperation with the Los Angeles Area Chamber of Commerce, the Los Angeles Mayor's Office, the Port of Los Angeles, and the U.S. Commercial Service -- which focused on opportunities in each region for trade with Los Angeles companies. Delegates met with companies involved in water and infrastructure, entertainment and tourism, fashion, agribusiness, chemicals, and business incubation and training. Deputy Mayor for Economic and Business Policy Matthew Karatz stressed the importance of maintaining a global perspective. "It's natural for Los Angeles to look to the Pacific Rim and Latin America, but we can't forget about emerging markets elsewhere. There is great potential in Africa and the Middle East. We value our cooperation with NUSACC and look forward to growing those relationships." The road show events mark the official opening of the new NUSACC office in Los Angeles and new representation for the Chamber in Salt Lake City. Co-located downtown with the Los Angeles Area Chamber of Commerce, NUSACC-Los Angeles is headed by Associate Director Jessica Gray. Cynthia Douglass now provides an ongoing NUSACC presence Salt Lake City These additions mark NUSACC's commitment to the western international business communities and to providing its members and partners with ever stronger coast-to-coast service. The eleven states of the continental "West" (Arizona, California, Colorado, Idaho, Montana, Nevada, New Mexico, Oregon, Utah, Washington, and Wyoming) exported $10.5 billion in goods to the Arab world in 2011, representing almost 20 percent of total U.S. goods exports to the region that year. California exported $3.9 billion in goods to the Arab world, with the United Arab Emirates, Saudi Arabia, and Egypt as its largest trading partners. Top exports from California included Transportation Equipment, Computer & Electronic Products, and Agricultural Products. California's exports represent seven percent of total U.S. goods exports to the region. Meanwhile, Utah exported $91 million in goods, with top exports including Primary Metals, Transportation Equipment, and Fabricated Metal Products. ​According to recent research conducted by the National U.S.-Arab Chamber of Commerce, the five nations represented on the road show are responsible for almost 22 percent of all U.S. trade in goods to the Arab world. Egypt is the top importer in this group, purchasing $6.2 billion in U.S. merchandise last year. Morocco comes next at $2.9 billion, followed by Oman at $1.4 billion, Bahrain at $1.2 billion, and Tunisia at $586 million. Delegates praised NUSACC's connections to the business and political leadership in both states. Rose Sager, Trade Representative for Bahrain, said, "The road show that NUSACC arranged has been absolutely terrific. The entire staff -- in DC, Salt Lake City, and Los Angeles -- are so friendly and helpful, organized, and knowledgeable. They arranged an excellent itinerary with effective and productive meetings and included relevant site visits. Our entire Delegation could not be more pleased with the Los Angeles and Salt Lake City road show!" Dr. Ashraf Ezzeldin, head of the Egyptian Economic and Commercial Office in Washington DC said, "It has been a wonderful experience for me to be part of the US-MENA Global Trade Alliances road show in Salt Lake City and Los Angeles. This experience has given me an opportunity to meet with many representatives of American businesses from different sectors in this region, representatives of local government as well as students who will be a part the business community in the near future. I have been able to exchange information and views on how to enhance and improve trade relations between United States and Egypt, and I feel the road show has been a very successful and fruitful program." Said Morocco's Economic Counselor, Abdeslam Zefri, "NUSACC brought together good win-win contacts in all sectors of trade and investment including renewable energy, agriculture, agribusiness, textile and apparel, infrastructure, and others, such as tourism and education. They did a tremendous job as a non-profit organization under the umbrella of the Arab League putting together profitable connections and helping to build strong commercial bridges between the MENA region and the United States." Shireen Said, Commercial Attache from the Embassy of Oman said, "The road show was a great success and generated a strong interest in expanding commercial relations between Oman and the U.S. NUSACC provided opportunities to network and explore mutual business interests and partnership with firms in Los Angeles and Salt Lake City, taking advantage of the benefits of the Oman FTA, particularly in the areas of information technology, textiles, renewable energy, and education." Bouzekri Rmili, Economic and Commercial Counselor for the Embassy of Tunisia, thanked "the entire NUSACC team for the fantastic, excellent road show through Salt Lake City and Los Angeles. Mr. Curt Silvers, Ms. Cynthia Douglass, Ms. Jessica Gray, Ms. Jasmin Navarro, and the entire staff have been just wonderful and very helpful. Everything was so well-organized, with many great networking opportunities and site visits." "NUSACC is privileged to organize this first-of-its-kind road show for Arab commercial attaches based in the United States," said David Hamod, President & CEO of the U.S.-Arab Chamber. "This trip is part of our Chamber's mission to offer coast-to-coast service in support of U.S.-Arab commercial relations, but it would not have been possible without the excellent insights generated by these diplomats. The road show revolved around these five delegates, and we commend them for their enthusiasm and strong commitment to carry their commercial messages to the business communities in Utah and California."